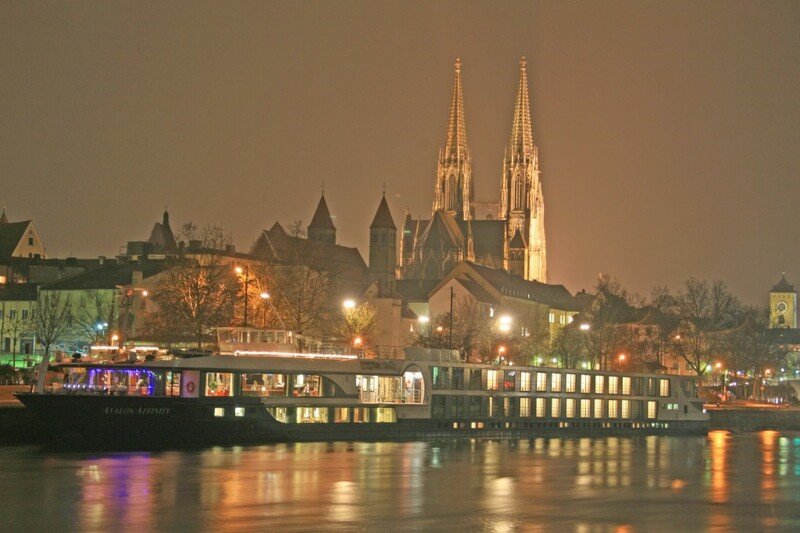 Avalon Waterways currently operates 19 ships, 12 of which are based in Europe. 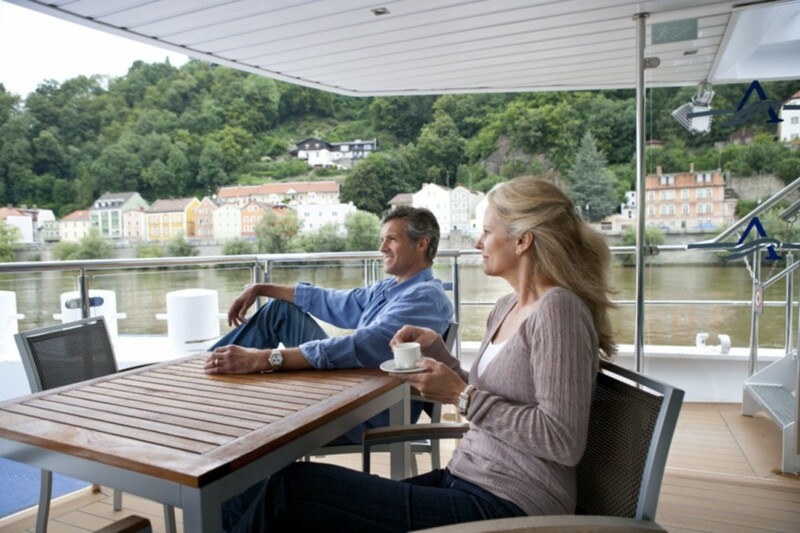 Despite river cruising having a 10-month season many with inclement weather possibilities, the demand for boats with balconies is high. In 2011, Avalon unveiled their new ship design termed ‘Suite Ship’ on the Panorama, complete with more balconies and suites and two more ‘Suite Ships’ will sail in 2013, the Expression and Artistry II. These new ships are very popular, offering floor to ceiling glass doors and an open air balcony concept. Avalon’s river boats have guest capacity of 130-160, with a crew of about 40. The average age onboard age is 65. 60% of passengers are from the US, with the remaining guests residents of Canada, the UK, Australia and New Zealand. Ten of their ships operate with full elevator service from deck to deck. 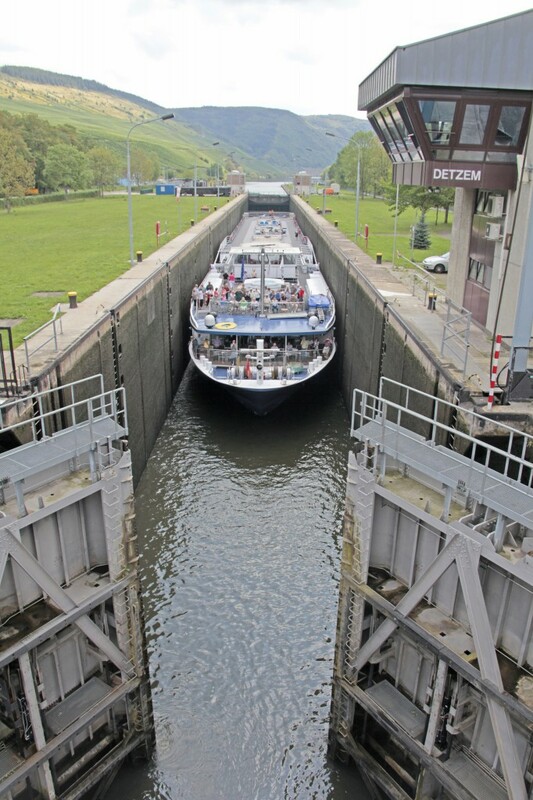 Tranquility and Imagery are two ships with no elevator at all. Avalon was established in 2003 and is a member of the Globus travel company, an 80 year old Swiss organization begun by Antonio Mantegazza in 1928. The company’s positioning is helpful when it comes to securing crew although a Swiss crew is far too expensive for any but specific onboard management positions. Avalon built the Tapestry in 2004 and is steadily adding more ships and destinations. Today, they own three ships in Asia; Avalon Angkor, Century Legend and Century Paragon. They also manage, but do not own the American Queen in the US, the Mayfair and Kasr Ibrim in Egypt and Santa Cruz in the Galapagos Islands. The crew on-board is European. Avalon claims they try to have a crew reflective of the region in which you are sailing. Translation: A preponderance of Eastern bloc nationals to whom the nuances of high-end service is theoretical. The term “open air balconies” is how Avalon describes the 11-foot glass wall that slides open to reveal an open air space where 6 adults can comfortably lounge. This French balcony can only be found on the newest ships; Visionary, Vista, and the two new ships for 2013, Expression and Artistry II. Best Accommodations: Cabins found on the new ‘Suite Ships.’ Royal Suites include the open air balconies, the use of an iPad while onboard and a spacious, well-designed 300 square foot cabin. 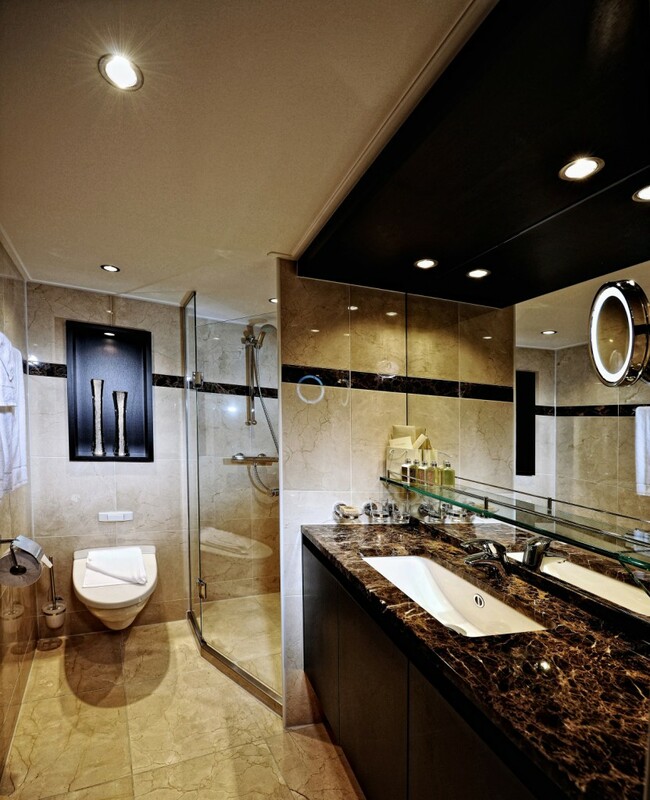 Memory foam mattresses, flat screen TVs, glass shower doors and marble baths are standard. Standard Accommodations: These cabins are on higher decks with an adequate 200 square feet of space. Entry-Level Accommodations: Cabins found on the lowest levels and measure just 172 square feet. Cabins come stocked with a mini-bar that has a per item charge. Bottled water is stocked complimentary. The bathrooms on each ship are full size with showers only. The new ‘Suite Ships’ feel more spacious with glass shower doors, marble finishes and L’Occitane bath products. Breakfast and lunch are served buffet-style with many options. Continental breakfast is available for room service. BBQs are held frequently on the sundeck. Food allergies and dietary concerns are accommodated routinely with ease. The rotating dinner menu features a specialty dish from the region. A five-course welcome and farewell dinner adds a festive feel to mealtimes and special chef ‘tastings’ are common. Wine, beer and soft drinks are included with dinner. Beverage Service: Self-serve coffee station is complimentary. Juice is included with breakfast. There is an additional charge for beverages served outside the dining room. The spirits package is $224 per person and the non-alcoholic package is $172 per person. Guests are encouraged to experience local cuisine and the onboard Guest Services can assist with recommendations and reservations for dining onshore. A word and about DRESS and LAUNDRY: The dress onboard is casual, even for the welcome and farewell dinners. Laundry service is available for purchase with 24 hour service. A pair of slacks cost $6 and a shirt is $4. Can be pre-paid with your final payment 90 days prior to departure. Suggested gratuities are 3 Euro per person per day for the Cruise Director and for the Maitred’ and 12 Euro per person per day for housekeeping and dining staff. ‘Avalon Choice’ provides three options operated through Avalon’s parent company, Globus. These shore excursions are classified as ‘Traditional’ for the standard must-sees, ‘Leisure’ for those who prefer a more casual pace and ‘Essential’ for those who wish to squeeze as many sights in as possible. Quietvox transmitters and ear phones are utilized for tours. Guided bike tours are offered in several ports. One tour option in each category is included complimentary at every port, typically a walking or driving tour while additional offerings come at a supplementary cost. Additional tours can be pre-arranged online prior to departure and are paid in US dollars. If you join a tour onboard you will be charged the cost of the tour in Euros. A visit to Versailles is 62 Euro per person, The Louvre is 49 Euro per person and Moulin Rouge is 167 Euro per person. In 2013, Avalon’s onboard Guest Services will begin customizing tours for guests. Tried and failed in the past, it will be interesting to see how well Avalon can handle the complexities of last-minute itinerary planning. As the best professional guides throughout the world are always booked far in advance, we do not recommend waiting until you are onboard to make private tour arrangements. Touring the galley and bridge, watching a movie or listening to a lecture are some of the entertainment options after dinner. Art demonstrations and beer and wine tastings are popular too. Many riverboats are reduced to offering folklore-ish, over-supplied, costumed, local talent for evening entertainment as the audience will have left town the following morning however Avalon does try to make a palpable effort in this arena. Each ship is equipped with a small fitness center including a few workout machines, dumbbells, a television and a small area to stretch. Should more than three guests decide to use the facility at the same time, crowd control is required. On the ‘Suite Ships’ the gym is slightly larger. There is a whirlpool onboard each ship. No spa or masseuse services are available however a hairstylist is available with a small salon for services by appointment only. In 2012, Avalon waived the single supplement fee for all sailings. In 2013, an early booking savings ranging from $250 to $500 per person will be offered. Deposits are flat rate of $250 per person for cruise only booking or $550 per person if you book your air through Avalon. As with all river boat operators, we do not recommend relying on internet promotional pricing as it is often inaccurate or out of date. Avalon offers a travel insurance policy underwritten by TripMate. If paid at the time of deposit, pre-existing conditions are covered and you may cancel for any reason. If you cancel for a non-medical reason then you will receive a future cruise credit only, to be used within two years. Cancellations for medical reasons allow for a full refund. 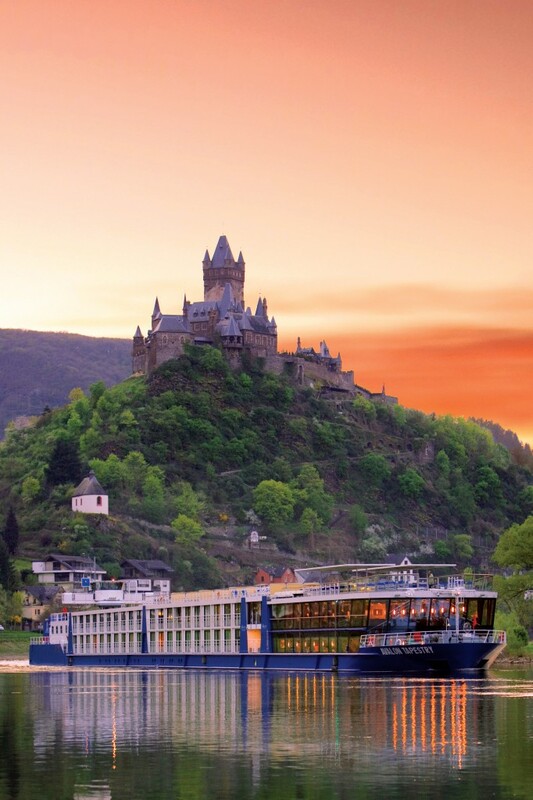 “Our Southern France river cruise consisted of two ports, Arles and Avignon; after which, our first river cruise vacation became a bus tour. Avalon probably was aware of high water (late spring 2016) impacting cruises, and did not give any advanced notice to passengers.